Not surprisingly, there are different types of muscle cells, a characteristic that enables humans to perform explosive movements of short duration as well as complete amazing feats of endurance exercise. The muscle fiber (cell) types are simply referred to as type I (slow twitch) and type II (fast twitch). In one sense, losing weight can be as easy as moving more and eating less. For some people it is that easy. After all, the laws of thermodynamics can’t be broken: If you ingest fewer Calories than you expend, you will lose weight over time. Yet for other people, moving more and eating less do not have the same satisfying results. Muscles use oxygen to produce much of the ATP required for contracting muscle cells and fueling other tissues throughout the body. At rest, you breathe slowly but at a rate sufficient to expose the lungs to ample oxygen and flush out the carbon dioxide resulting from energy metabolism. You know what it’s like to sweat, but few understand the true importance of sweating during physical activity or heat exposure. Whenever core body temperature rises above the sweat threshold, sweat glands in the skin begin to produce sweat. 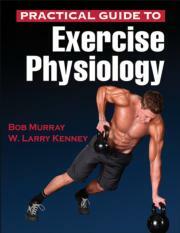 Practical Guide to Exercise Physiology gives health and fitness professionals the confidence to design physiologically sound exercise programs and explain to clients the science supporting the program design.